For over 20 years the team at JP Metal Fabrication have manufactured & sold thousands of custom fire hitches. The perfect hitch plate for a fleet of fire engines. Additionally, they make great gifts for retiring fire fighters & EMTs to wear they pride on their ride. The all new FireHitch.com puts these products at your fingertips, including designing or uploading your own company fire hitch. A sturdy, responsive & effective online store built by the Remark team. With a website from around 2004, our team had a lot of content creation fore the project. Capturing the history, symbolism & culture of their customers was important. A classic Americana feel – diamond plate, shiny metal & bright metallic colors to catch your eye & assure a deep connection with potential customers. Consolidating their online finances & stepping up their game online was a great decision. The old FireHitch.com used a cookie cutter PayPal e-commerce. No shipping solutions, not taxes collected & money collected off site. Goodbye cookie cutter garbage, hello 21st century! The new FireHitch.com is a fully on-site store – complete with encrypted transactions, calculated shipping options & automated taxes. 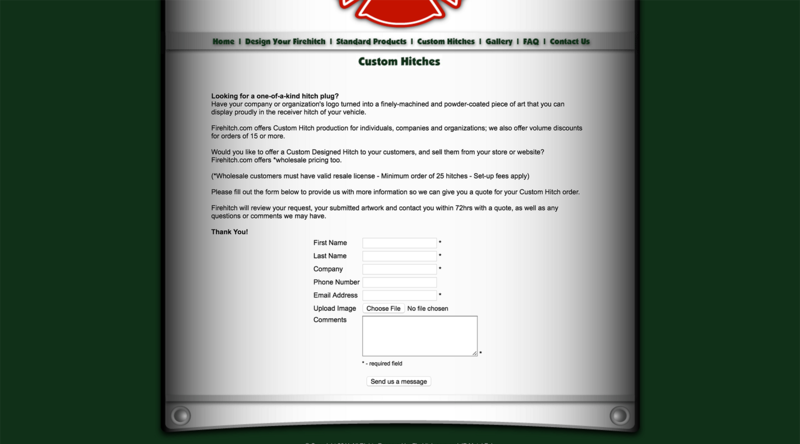 Along with the highly effective e-commerce is a design tool for FireHitch.com. Select your hitch style, color, number of lines & hitch size – then enter your custom text. This tool allows a live preview of your custom hitch during customization. What was once a 4 page process is now 1 page of live interaction & preview. Additionally, you can get a free quote for a custom uploaded design or logo for manufacturing. Thank You JP Metal Fabrication! With the successful launch of FireHitch.com comes a new flagship site to showcase the amazing services our team has to offer. Sharp & stylized graphics. Intuitive & responsive design. Sturdy & effective e-commerce tools. Thank you to the guys at JPMetalFab.com for making the right choice in hiring trusted professionals at Remark.